Parkinson’s disease can affect either men or women and the onset is as early as 40 years of age up to 60 years of age. It is currently estimated that 50,000 Americans get diagnosed with Parkinson’s disease a year and 1.5 million Americans suffer from the condition. Only about 5 to 10 percent of Parkinson’s cases are diagnosed around the age of 40 with the onset being more common over 50 years of age. Whites tend to develop Parkinson’s more often over other races. Parkinson’s tends to progress to total disability and patients need assistance with most activities. Shaking hands and inability to talk requires someone to assist with walking, teeth brushing, eating and other daily tasks. This can cause strain to families and caregivers and some patients often need rehabilitative or convalescent living. The exact cause of Parkinson’s is still unclear, but it originates in the center of the brain that regulates the movement of our bodies. 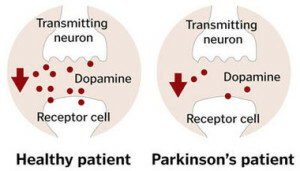 There is a chemical called “dopamine” that helps to calm transmissions in the nervous system and it has been found that people with Parkinson’s have lower levels of this chemical. (See Figure 2) There is another chemical called “acetylcholine” that also helps body movements flow in smooth fashion that appears to be low in Parkinson’s. What is known is that Parkinson’s may slightly follow a genetic tendency. However, the numbers of people with genetic Parkinson’s are relatively small. Chemical exposure, drug use and alcoholism show higher rates of Parkinson’s disease and may be attributed to changes in the balance of brain chemicals. A few studies show that people with Parkinson’s disease have a higher number of abnormal cells in the brain that are called “Lewy Body’s.” Lewy Body’s are made up of a protein that moves into and takes over the entire brain cell and disrupts its function. Lewy Body’s are also found in some types of dementia. For the most part, Parkinson’s is still a very mysterious disease and often hard to diagnose. It is often mixed up with other neurological disorders, because of its multiple various symptoms that can mimic other conditions at first. In the early stages, Parkinson’s disease manifests itself as; limping, lack of arm swing on one side, frozen facial expression, softening of the voice and stooping posture. The trembling is often subtle in the early stages and people often complain of feeling like they are shaking on the inside, but the movements cannot yet be seen. A late symptom of Parkinson’s is loss of ability to walk. The leg movements go from a shuffle to the complete inability to move one or the other leg. At this point, a patient with Parkinson’s becomes almost completely disabled and need total assistance with the activities of daily living. 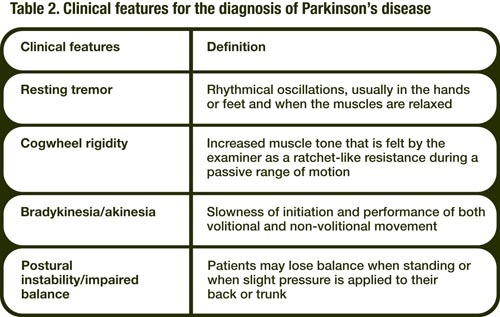 Figure 3 is a chart of the different Parkinson’s symptoms and how they affect different parts of the body. Treatment for Parkinson’s focuses on helping the patient gain some control over their movements. There are a few different options including; medications that mimic or help the body use dopamine more effectively, Surgery and rehabilitation therapy. The drugs used in Parkinson’s help to control the movements, but can have side-effects including; nausea, excessive sleepiness, added involuntary movements and low blood pressure. Many neurologists have found combinations of certain medications are more effective than just one medication. The only drawback to medication is that over-time the effects tend to “wear off” and the patients symptoms worsen. This is when they may resort to surgical intervention. Surgery for Parkinson’s involves placing electrodes deep in the brain to assist with regulating the nerve impulses in the brain. 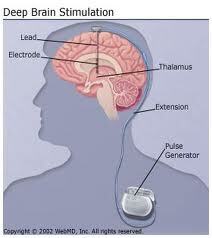 (See Figure 4) This procedure is known as “Deep Brain Stimulation.” The electrodes “turn-off” the bad cells and assist the good brain cells with doing their job properly. This technique is very successful and can restore proper movements in up to two-thirds of people that suffer from Parkinson’s disease. This procedure is often used as a last resort, due to the risks of bleeding and infection from the procedure. It only requires a small maintenance to change the battery on the system periodically and patients can usually go home the day after the electrodes are implanted. Physical and occupational therapy are almost always necessary to keep Parkinson’s sufferers functioning at the highest levels possible. Occupational therapists can assist with devices and techniques to help the patient; eat, drink, wash and dress themselves and other daily activities. Physical therapy can teach techniques for safe walking and movements to help the patient avoid injuries. They can also help work and strengthen affected muscle groups. Having a good healthy lifestyle is important. People with Parkinson’s need to be eating a healthy diet that is rich in Omega-3 fatty acids to help brain cells function at their highest level. It is also important to drink lots of water and avoid alcohol and street drug use. Patients with Parkinson’s disease are at an extremely high risk for falls and injuries from falls. In order to avoid this, it is important to use extreme caution when walking. Caregivers can also provide increased safety by securing loose rugs, keeping walkways clear and hide or cover any electrical cords in pathways. Also, keep the house well lit and use night lights during the night. Parkinson’s is a severely disabling disease and can affect the quality of life for both the patient and family. With proper treatment, education and caregiver training; people with Parkinson’s can live and enjoy life for a very long time.